“THE INNOCENT SEVEN may very well become a controversial film. A simple glance at the plot may lead some to consider this a fictitious piece in bad taste, but they will soon be amazed to learn that the film is based on frightening real-life acts, which we must not divert our eyes from. 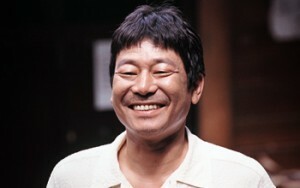 Known for his ingenious performances in such films (by directors who form the core of present day Japanese cinema) as Takeshi Kitano’s 3-4X JUGATSU(BOILING POINT), Kiyoshi Kurosawa’s KUMO NO HITOMI/EYES OF THE SPIDER or Shinji Aoyama’s CHINPIRA/CHINPIRA: TWO PUNKS, Dankan captures us all with his uniqueness qualities. 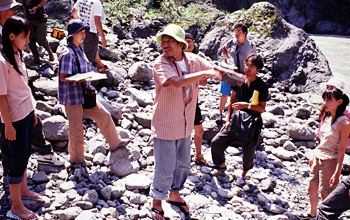 Yet, he turned to writing and revealed his talent in his screenplay: IKINAI, and now he adds the title director to his brainchild, THE INNOCENT SEVEN. With its suggestive title, the content of THE INNOCENT SEVEN is shocking and, at the same time, ambiguous. The story unfolds in the backdrop of a camping resort in the mountains. Seven parent-child groups arrive to enjoy their short vacation—a scene commonly seen in most camping grounds. But this “family outing” was prepared to disguise a very special business transaction, which is about to take place. With carefully planned instructions from a mysterious leader, the parents try to fool their children by putting on their last performance as benevolent guardians. Usually abused, the children become skeptical of their parents’ behavior. And eventually, the fates of both the children and their parents take an unexpected turn. By merely following the plot, THE INNOCENT SEVEN may strike as being a bizarre piece, but it is neither grotesque nor nerve wrecking. First of all, the film calmly takes time to focus on each child’s background of being abused at home. Based on this, director Dankan presents the true, ruthless nature of the parents as a comic manifestation of humanity. Further more, Dankan juxtaposes a layer of the sorrowful mental aspect of the children, who, despite being abused and are about to be “dumped” physically, cannot help loving their parents. Even though these are contradictory elements, what Dankan has orchestrated is not a disharmony. It is, indeed, an unprecedented emotional symphony. THE INNOCENT SEVEN is an “open” tragicomedy, allowing the audience to interpret it in whatever way they prefer. Placing a social phenomenon as its foundation, Dankan’s cinematic narrative tone in weaving the universal love-hate relationship is not depressing, but is wrapped in strangely humorous tenderness. Read more. While peering inside the individual characters, the film beautifully creates the humor emerging from a situation where characters display their collectiveness when cornered. With years of experience as a writer of TV variety shows, Dankan’s keen observation of people is exceptional. This can be seen in the last scene where the song “It’s Great to be Human” is sung. Hearing this theme song of a popular cartoon show, the audience will be moved as well as shudder, reflecting on the film. 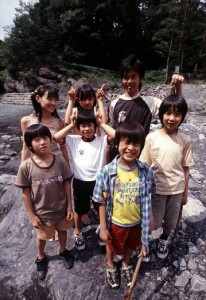 In a way, THE INNOCENT SEVEN is an extraordinary “family” film, and the combination of the cast taking part in this group drama is excellent. As the film begins and ends with scenes in the bus some may be reminded of IKINAI. The appearance of the mysterious leader of the group in THE INNOCENT SEVEN is also reminiscent of the tour conductor in IKINAI, since he becomes the vehicle to regulate the format and leads the group like a fixer. Dankan plays this role, but he is surrounded by an array of unique and competent actors. Ikkei WATANABE, Hitomi TAKAHASHI, Hajime YAMAZAKI, Yoichi NUKUMIZU, Yoshiki ARIZONO, Yoko ISHINO, Pepe HOZUMI, Kaoru MIZUKI and Yoshitatsu YAMADA play the grown-up characters, who are somehow cynical and irresponsible, but strangely attractive, and cannot be truly hated. For this reason, the “honesty” revealed by these “normal people” is painful and heartbreaking. On the other hand, the cast playing the child characters are all choice new talents. They ably express the situation of their roles, having vertical relationships with their parents and horizontal ones among themselves, who share similar history of abuse.